At the end of the war, the personnel strength of the RAF stood at some 1,080,000 men. Of these, about 193,000 were aircrew. That is, for every flying airman, there were another six working on the ground in support, as groundcrew, office staff, medical orderlies, catering staff and the like (and latterly, the RAF Regiment). Edward Frank Cole, of yeoman stock, became one of this great army of groundcrew. His RAF Record of Service notes that he was born on 20 May 1920 at Dovercourt, then on the outskirts of Harwich in Essex. His father William Cole was the village baker in Great Oakley, a few miles away. In the summer of 1940, Ted Cole was a young farm labourer, still living at home with his Dad, two brothers and four of his sisters in Back Lane, just behind the High Street of Great Oakley. Lily, his mother, had died some years before. When Ted reported to No 2 Recruitment Centre at Cardington to join the RAF in the last week of July 1940, he had just turned 20. 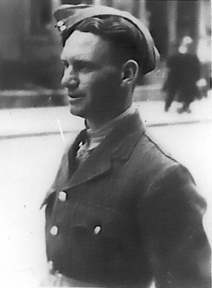 Taken captive at the fall of Java in March 1942, Leading Aircraftman EF Cole died of beri-beri at Sandakan on 19 January 1944. Thanks to his niece Alison Barton and her Mum, something of his RAF service can be retold here. So freshly uniformed, his eagle shoulder patches not yet put up, but every inch an airman. When Ted Cole reported at 2RC Cardington in the late summer of 1940, France had not long fallen and Italy had just entered the war in the Middle East. At home, the Battle of Britain was being fought out over the Channel: Goering’s Adler Tag was just a bare fortnight away. With thousands of men joining the RAF, the Recruitment Centres looked after new recruits, equipping them with basic kit and basic training. Joining as an Aircraftman 2nd Class (the lowest rank and common lot of newly joined airmen), Ted’s rural background saw him start at the bottom, as an Aircraft hand in the Group 5 trade mustering. Group 5 may have been for relatively unskilled men but it offered scope for advancement, with driver, armament assistant, motor cyclist, and ground gunner all among the recognised trades included there. Before a month was out, AC2 Cole was posted to RAF Locking, then a large training establishment for RAF ground trades. The now disused airfield there can still be seen on maps and aerial photographs. At Locking for 6 months from late August 1940 to late March 1941, he made steady progress, despite being hospitalised for three weeks. Having completed six months service without blemish, he was reclassified Aircraftman 1st Class on 31 January 1941, still mustered as an Aircraft hand in the General Duties branch. Promotion (reclassification, in RAF terms) to AC1 depended on passing the necessary recruit's drills (for example, certified as competent in the ground handling of aircraft, including in an emergency and in the event of fire), and upon approval by his CO. The qualifying period for this step up was set at nine months later in the war. Having achieved this level of competence, on 20 March 1941 AC1 Cole was posted to the Middle East. After travelling by troopship via the Cape of Good Hope to Egypt and ME Pool, he was posted to 211 Squadron on 10 May 1941. Presumably he served with them in the short movement to Palestine in May and June 1941 following the April withdrawal from Greece. In mid-June they were at last stood down from operational status after a year’s hard fighting, to form No 72 Operational Training Unit at Wadi Gazouza in The Sudan. In late 1941, the Squadron was re-forming and about to move to the Far East, extricating experienced aircrew and groundcrew from 72 OTU in the process. And there we find the one remaining firm trace of Ted Cole’s part in the Squadron. The Movement Order roll of 19 December listed him among the party of Aircraft Hand/Ground Gunners, as one of the 12 AC1s under the watchful eyes of LAC L Clark and LAC Tom Fisher. On the eve of departure for the Far East, Ted’s steady progress continued, with reclassification to Leading Aircraftman on 31 December 1941. As an LAC he could expect to be in charge of a group of other men for some tasks, under the eye of a corporal. This second step up depended on merit and vacancies, rather than simple seniority. Tom Fisher was promoted from LAC to Corporal about the same time. Perhaps LAC Cole then took charge of one section of the ground gunners. Like the bulk of 211’s airmen groundcrew, Ted Cole most likely went to the Far East with the Squadron’s Sea Party aboard HMT Yoma to Colombo. Departing Ceylon on Tuesday 3 February, they heard that Singapore was about to fall while still at sea. Yoma arrived at Oosthaven, near Telukbetung at the Southern end of Sumatra on 14 February. Disembarking, they made their way by rail towards Palembang, only to be returned within a day and evacuated to Java and Batavia (Tanjong Priok, the port of Jakarta). In the end, the groundcrew of the Squadron only met up with the other 211s at Poerwokerto and Tjilatjap, as Java was about to fall. Taken captive with his Squadron mates in March 1942, Ted Cole had been in the RAF for less than 2 years. In that time, he had made steady progress, from AC2 to AC1 at home, and in Egypt to LAC. 1175158 Edward Frank Cole was held Prisoner of War at Jesselton and later on Sandakan at No 2 (British) Compound for forced labour. In January 1944, LAC Cole died of beri-beri, an entirely preventable illness borne of the inadequate diet and appalling conditions that carried so many FEPoWs to death in Japanese captivity. He was 23 years old. His comrades buried him in No 1 PoW Cemetery near the 8 mile peg at Sandakan. In the post-war recovery of the dead, Cole was then reburied in the Sandakan War Cemetery. When that cemetery had to be moved in 1949, he was taken to his final resting place, in the War Cemetery on Labuan Island, in Brunei Bay on the north-west coast of Borneo. Though Ted Cole lies many a mile from the little village of Great Oakley and the green fields of Essex that were once his home, his service is commemorated in perpetuity by the Commonwealth War Graves Commission.